Hi, we can grind down your tree stumps, and cut trees for you pretty low priced for you. Please check out our website for much more information. We grind down tree stumps all over San Diego from the Border up to Oceanside, and out to Alpine and everywhere in between. 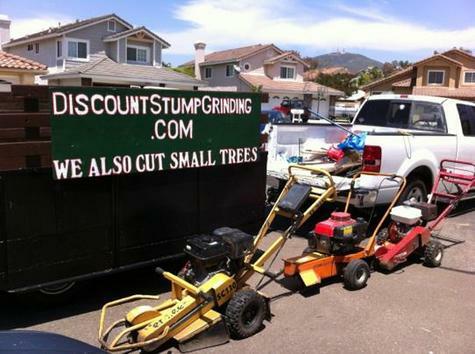 If you want an easy quote, just use your cell phone and snap a picture of your tree or tree stump for a free estimate and text your pictures to me at 858-997-7062. If you put a soda can on top of each stump and take a picture, I can easily give you a quick cheap quote for stump grinding. We also offer a rototilling service with our rototiller where we can come out and make your yard ready for you. We also do concrete cutting with your 13hp concrete walk behind saw. Check out our website for our cutting services.